*A Comprehensive review and medical form may be required to initiate services. Please make sure we have all relevant information to provide care in a safe and comprehensive manner. Objective of this agreement: We wish to establish a successful long term therapeutic relationship and want everyone to understand the system we work in and the rules and regulations that govern our services, as well as internal policies and procedures. ALL SERVICES ARE PROVIDED BY INDEPENDENT CONTRACTORS THAT ARE REGISTERED AS THEIR OWN BUSINESS WITH THE STATE OF COLORADO, OR VOLUNTEERS, OR EMPLOYEES OF CONTRACTORS. Communication via text messages or other similar platforms such as social media, are not HIPAA compliant. I understand that if I choose use these methods of communicaiton I am waiving my right to HIPAA in those instances. Do you have a occupational therapist? Do you have speech therapist? Do you have a gtube or jtube? I understand that I need to go to http://www.watchingfish.com if I need to update anything, request a change, etc. or call directly. or review policies and procedures. I know and understand my rights (details below and on watchingfish.com)? I know and understand the responsibilities of myself and of Angels Service LLC (details below and on watchingfish.com)? Example: I am a fun hearted little girl who loves to laugh, cuddle, play puzzles, stackers, read picture books, watch movies, and ride my special three wheeled bike. I also really hate spaghetti noodles. If you don't have any of the above, write none. The undersigned, in case of emergency and in the event the primary contact cannot be reached by telephone, does hereby give permission for medical treatment by physician or hospital selected by ANGELS SERVICE LLC AND COLLABORATORS . Such permission shall include any and all medical treatment which is necessary or desirable in the absolute discretion of any such physician or hospital. This medical care shall include, but is not limited to: examinations, treatments, immunizations, injections, anesthesia, surgery, and other procedures, etc. The undersigned gives permission for the applicant to ride in vehicles operated or leased by ANGELS SERVICE LLC AND COLLABORATORS and holds harmless the aforementioned for any accidents related to the ride. 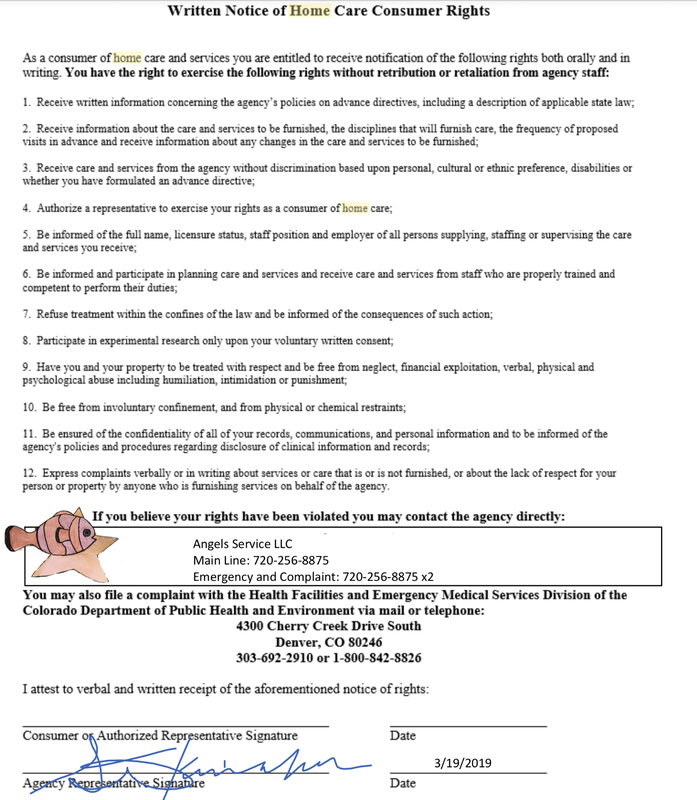 The undersigned recognizes the right of ANGELS SERVICE LLC AND COLLABORATORS, in his/ her absolute discretion, to terminate a client's services at any time due to disciplinary or medical actions which might jeopardize the client’s or client’s / collaborators health or safety while at receiving services. The undersigned further agrees to pick up the client / return home (depending on the details of service) immediately upon being notified of such termination. Fees are nonrefundable in case of above mentioned situations. The undersigned agrees not to receive services if client has been EXPOSED to a contagious disease within three (3) DAYS of the session scheduled time. I understand these are only the highlights, further information is below and within our online policy and procedure manual. Your appointment will include the following during the service time - Consultation, Program Planning and Review, Direct Service, Coaching, Caregiver / Parental Education, Notes and Receipt of Service. Receipt of Service includes a geolocation, timestamp, signature and photo verification. Signature is optional as not everyone is able to sign. Photo is required and may be of client (as some of us like to pose), numbers on house, or other client specific and chosen item. (It is the fail proof verification) Photos are never saved on devices and are only in the encrypted system. I understand that as independent contractors ANGELS SERVICE LLC does NOT guarantee the quality of work, control schedule or methodology of service provision. This is highly important as any consequence of negligence is the responsibility of the contractor. Any complaints or concerns should be shared as soon as possible with ANGELS SERVICE LLC so that we may work together to resolve conflict and create actions plans for prevention of future concerns / complaints. Family specific house rules and religion can be a very important part of a persons life. Record any special house rules or cultural expectations that need to be taken into consideration in order for services to be provided in a considerate manner in the box. We are required to offer information regarding advanced directives. This information is intended for educational purposes and is not legal advice. Angels Service LLC and all those associated are held harmless for any injury, loss or harm which may occur as a result of interpreting information or lack of information contained within this document. https://www.youtube.com/watch?v=QcauNT3x2k8&feature=youtu.be visit here if you would like to learn more about planning and why it is important to plan from Kimberly. PLEASE IF YOU WOULD LIKE TO COMPLETE AN ADVANCED DIRECTIVES FORM, TALK TO YOUR DOCTOR AND THEN PROVIDE US WITH A COPY. To find an Elder Law Attorney to assist you, visit the National Association of Elder Law Attorneys web siteand click on “Find an Attorney”; or visit the the CHOICE Advisory web site to view Attorneys advertising their services to the public. As a mother to a child the founder of this agency is well versed in quarterly meetings with case managers, 60 day recerts for nursing and other professional services. In order to align with best practice monitoring we to do reviews on a regular basis. Once a year we need to see you, this may be in person or through a video chat, which ever works best for you. HOWEVER, IF THE SERVICE IS COMPREHENSIVE VISITS ARE EVERY MONTH OR IF THEY ARE HANDS ON SERVICES THEN EVERY THREE MONTHS.Throughout the year we will do result monitoring by reviewing notes, reaching out to you, or talking to your providers. Please feel free and encouraged to reach out whenever you like. If you have praise, concerns, or updates regarding medications, scheduling, needs, etc. Please visit our website www.watchingfish.com and see the bottom of the page and find the section that says "I'm a Family Member or Client" There will be forms for updating your information, concerns, praise, etc. or call 720-256-8875To file a complaint with the state: Call 303-692-2910 It is highly recommended in the case of a concern to start with the main number for the agency so that we can complete the grievance and compliant procedure in order to come to a resolution. IF WE DO NOT HEAR FROM YOU OR YOU DO NOT RESPOND TO OUR REQUEST FOR AN UPDATE WE WILL ASSUME THAT ALL IS WELL WITH SERVICES AND LIFE IN GENERAL, SO PLEASE IF YOU NEED ANYTHING, LET US KNOW. This agreement is permanent, if changes need to be made or consent revoked it is client's or client's representative's responsibility to do so in writing. I understand that if anything changes with the waiver funding services or any other aspect of the client profile (needs, wants, diagnoses, medications, surgeries, etc.) I must directly update AngelsServiceLLC@gmail.com in order to make sure care is provided in the best way possible. support, planning, and developmental. This includes my local Community Center Board, State agencies, Contractors, and Inter-Disciplinarian team members. I hereby authorize the mutual exchange of information regarding the named person and the agencies / individuals listed on this form. INCLUDING, NOTES, CLIENT DETAILS, PHOTOS, VIDEOS, OTHER WORK SAMPLES, AND PROFESSIONAL OPINIONS. There is a focus on trans-disciplinarian teamwork, this means that professional from different backgrounds will discuss different details and strategies to improve services. I have been fully informed of the intended use of this information sharing. I also understand that the agency / person receiving this information is obliged to maintain it in a confidential manner and it is to be used only for the purpose I have authorized. I understand that this information will be kept in a database that is password protected,and for the exclusive goal of optimizing communication, resources, and supports for (myself, child, and / or family). ANYONE ELSE YOU WOULD LIKE US TO SHARE WITH? DEPENDING ON WHO IT IS WE MAY NEED TO COMPLETE A FORMAL STAND ALONE RELEASE. ANYONE WHO DO NOT WANT US TO SHARE WITH? It is my right as the client / family member, and my responsibility, to communicate with the agency and provider. If I have specific techniques or programming that I would like to see I will share this with the agency so that it can be part of the plan. Call service coordinator to assist with finding support groups, resources and billing questions. • Create the most relaxing environment for themselves based off of their personal preferences. o Oil, lotion, or dry, scents, etc. Client care is extremely important to Angels Service LLC and that support is always available. Angels Service LLC is working to bring a wider network of care together by using Independent Contractors which provides for a variety of programming. All Independent Contractors are registered businesses in Colorado, complete a background checks, signed a contract, provided proof of Mandated Minimum Training that includes proof of their understanding of Colorado's rules and regulations. Angels Service LLC does not guarantee quality of work performed by each independent contractor. Angels Service LLC accesses funding through multiple waivers and follows the rules and regulations governing these services as must all Independent Contractors. Angels Service LLC does not have direct over site on work quality. What Angels Service LLC does do is ensure quality customer service, accurate billing and prompt communication between all parties while monitoring service results and conducts regular reviews with client and providers. Angels Service LLC is here to connect Independent Contractors with those who are seeking services. We are here to help find a provider, answer any questions, address any concerns, and make sure that services are completed in a timely manner and that the results of service are satisfactory. We will respond promptly to any concerns and Independent Contractors who are not able to satisfy service plans will not be granted a contract. Some services, such as massage therapy or certain skills acquisition or replacement programs may include specific restrictive practices in order to meet the goal. This falls outside of the restraint procedures. *For example, range of motion, stretching, bolstering, and positioning in massage therapy may be restrictive. *For example, hand over hand work to help with skill acquisition may interrupt a client's preferred movement pattern or activity. Timeliness is important and we strive to begin sessions at their scheduled time but due to driving between homes and uncontrolled circumstances start time may vary 10-15 minutes at times. If your service is time sensitive, such as the provider is the only one caring for a client after school or another caretaker will not be available to provide care, make this known so that providers can arrange schedules to accommodate the time sensitive nature of the appointment. If at any time your provider is not providing the agreed upon service within your expected timeline, reach out an alert us directly. · Safety is our #1 concern. Home visits may be cancelled if road conditions are poor and there are travel advisories. -Caregivers must be present for the entire visit for early intervention. -Other services and individualized service plans may or may not require caregiver presence during sessions. · Please call the provider to cancel appointments. Sessions may not be able to be rescheduled. If there is less than 3 hours notice, a care conference may need to conducted. If client's do not regularly keep their appointments service may not be able to continue. · Please note that frequency of visits may be reduced or change during holidays, vacation times, or due to a provider becoming ill. If the provider cancels the care-giving responsibility reverts to the primary caretaker unless other plans are specifically made. · If a family is not home for a scheduled visits, does not return phone calls or other attempts to contact them, it is assumed the family does not want to participate in services and will be discharged. This will be documented and the case manager updated. · If individual has aggressive challenges caretaker must be close at hand during sessions and is responsible for intervening and any damages unless otherwise planned for. *Requests for schedule changes will try and be accommodated but will depend if the provider has openings. If you are receiving Early intervention services they end at the child's 3rd birthday / family discontinues services / services is no longer needed / funding is not available. If you wish to discontinue services you may do so at anytime. Please let us know. If your provider become unavailable outside of basic illness or vacation we will reach out to you to discuss options such as another provider with our agency if possible or contacting your case manager for a referral. Depending on your service type, we may also contact CDHPE at the state to inform them that we cannot provide services. If due to actions from the client or family that jeopardizes the well-being of a provider an emergency discharge will take place and case management and CDHPE will be notified within 48 hours. Consent to Treat: I consent to receiving services on my behalf or on the behalf of someone I have the legal right to consent to services for. I understand that I have the right to have electronic communication encrypted. I understand that all my information will be protected and that the software that Angels Service LLC uses is HIPAA compliant. Client or responsible agent is responsible for payment if insurance does not reimburse services. (Does not apply to Medicaid clients when the service is a covered service in detail, frequency, and duration). If you would like a copy of any policies and procedures please request them in writing. Otherwise, we are a paperless company and all policies and procedures are found on our website. http://www.watchingfish.com/expectations This is our policy and procedure manual. There are also many other resources. We are unable to serve critical care clients and if this is your need would like to help you find an agency with the skill set you need. Level One: We have a busy life and like to skip making up missed sessions for both when we cancel and when a provider cancels. Level Two: We have a busy life but would like to try and make up missed sessions when possible. Level Three: Making up missed sessions are a priority and too many missed sessions may result in needing additional or different providers. Level Four IRSS clients: Sessions are very important and I need them. However, I am safe and able to function if I miss up to FOUR DAYS IN A ROW OF DIRECT CARE holidays, illness, weather, or other reasons outside of comprehensive emergency. Level Five IRSS clients: Session are vital and I have a live in provider who is able to meet my needs. Critical Care All clients: Sessions are a must to my well being and are time time sensitive. I am unable to miss sessions. I need help finding an agency who is able to provide critical care. We are able to print you off an emergency sheet that includes information about you, your medical background, insurance, and your safety plan so that you can keep it with you, in your emergency bag, or for visitors / first responders. Would you like a copy? Some of these questions are because we provide long term care and residential care. That is why they are here but not required as they may not apply to everyone. After a disaster, let your friends and family know you are okay by registering at“Safe and Well” at https://safeandwell.communityos.org/cms//or by calling 1‐800‐733‐2767. You can also give them a call, send aquick text or update your status on social networking sites. What are the escape routes from our home? Any route information on how to get to other meeting locations you want to provide.